Lord Howe Island, c1951 ANMM Collection: object number 1404 by Gervais Purcell, courtesy of Leigh Purcell. 1950s Australian tourism is the theme of the latest set of historic photographs from the emerging Gervais Purcell archive at the Australian National Maritime Museum. Taken on assignment for Ansett Airways, these images from the brief years of the Australian flying boats are doubly significant because they mark the advent of colour photography. 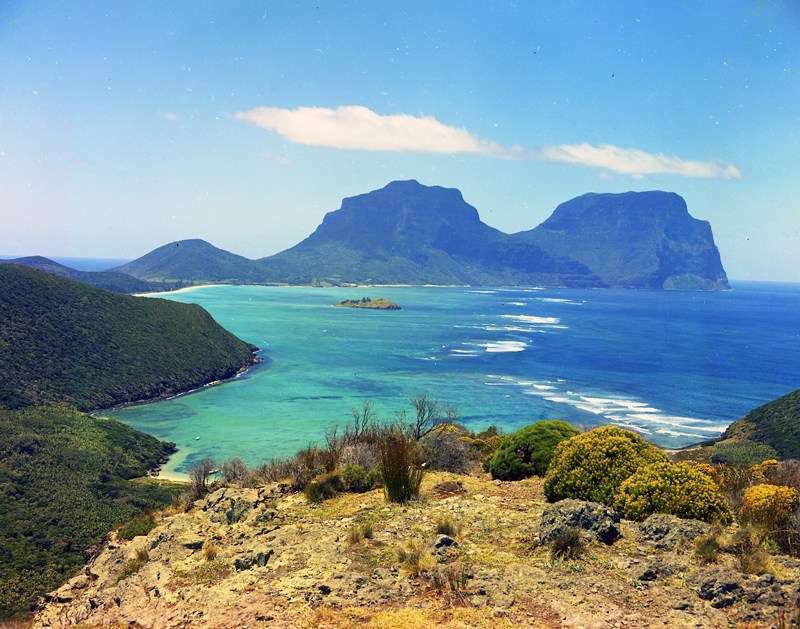 A view of Mount Gower and Mount Lidgbird on Lord Howe Island. ANMM Collection: object number 1404 by Gervais Purcell, courtesy of Leigh Purcell. Early colour film processing and printing was expensive and wasn’t widespread in Australia until the late 1950s. Technical complications sometimes caused costly print delays but printers, advertisers and commercial photographers like Gervais, had to quickly master the new medium. The Melbourne Argus newspaper was one of the early adopters of the technology in 1952, and accrued significant debt in its aggressive move to lead the market. The tourism industry was well placed to harness the photogenic potential of exotic landscapes in a world beginning to transmit colour. The view from North Bay, Lord Howe Island. ANMM Collection: object number 1404 by Gervais Purcell, courtesy of Leigh Purcell. Lord Howe Island is a volcanic remnant 600 kilometres north-east of the coast of New South Wales in the Tasman Sea. It is a registered UNESCO World Heritage Site. During World War II it was a Royal Australian Air Force (RAAF) meteorological station and radio base, from which large Catalina flying boats flew regular missions. These days its dominant industry is tourism. The first sea-plane to arrive on the island was in 1931. You can read about that aviation expedition by Francis Chichester on the Lord Howe Island Museum website. Flying boats are distinguished from sea-planes by their boat-like hulls that can rest in the water, and the pilots of both types of craft needed good nautical skills to manage the changing conditions of wind and sea when afloat. 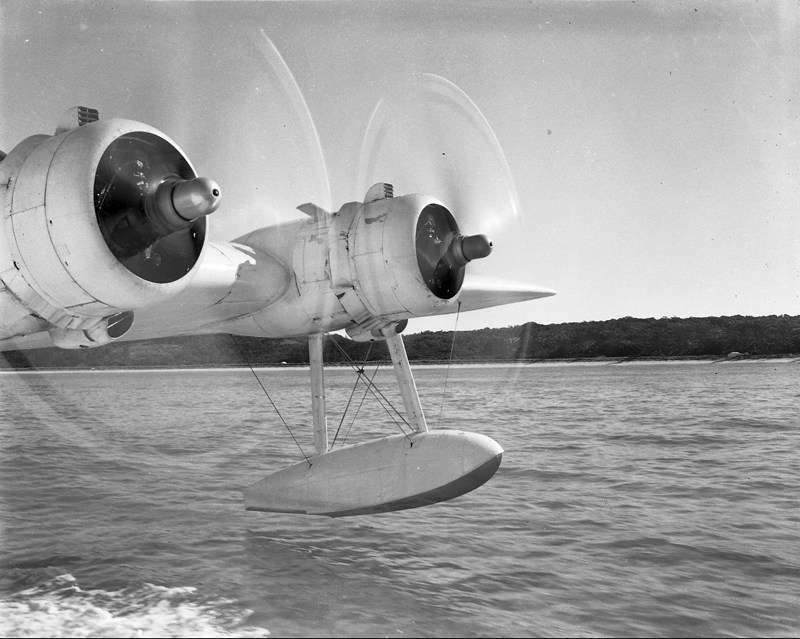 Ansett Airways’ flying boat Beachcomber, Sydney Harbour c.1951. ANMM Collection: object number 1404 by Gervais Purcell, courtesy of Leigh Purcell. 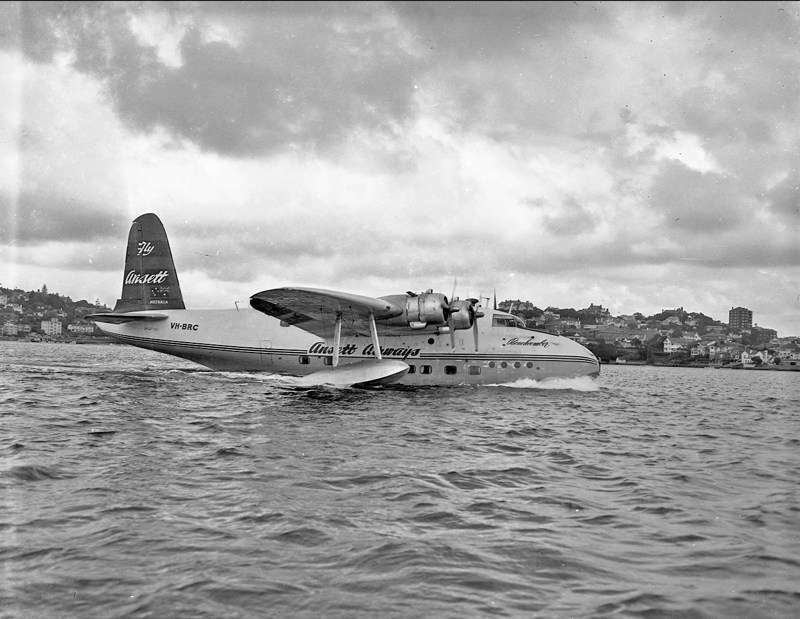 Trans-Oceanic Airways (TOA) pioneered the first commercial passenger flying boat service to Lord Howe in August 1947, with Qantas starting a similar service to the island a few months later. Both companies operated out of the Rose Bay Airport on Sydney Harbour. At the time, Australians were listening to the songs of Perry Como and Bing Crosby, and learning about Christian Dior’s New Look Parisienne fashions. 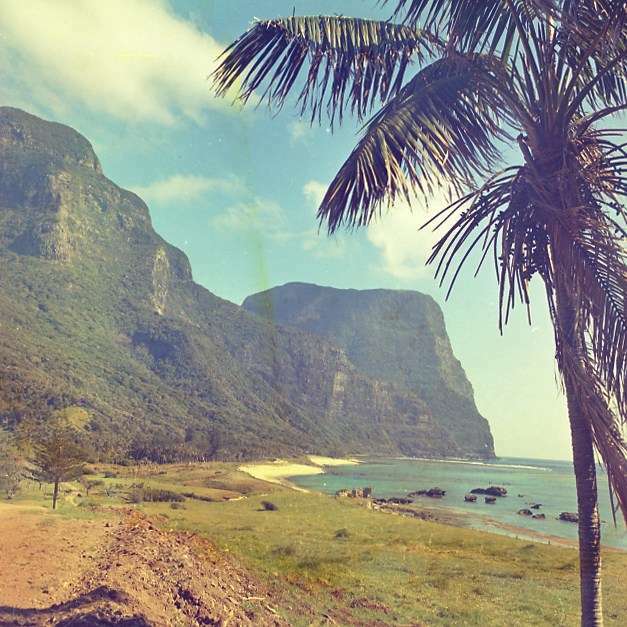 When TOA and Qantas ceased the Lord Howe Island route three years later in 1950, Ansett filled the niche and offered up to six flights a week from Rose Bay, each way a three-hour trip. There were three air-craft: Beachcomber, Pacific Chieftain and Islander. All were Sandringham type. Beachcomber, which features in Gervais’ photographs, was originally built in the UK as a Sunderland (1943) and was converted by Ansett to a Sandringham. Pacific Chieftain suffered severe storm damage twice in 1964 and was replaced by Islander. By 1974 the production of flying boats had diminished. Parts were expensive and technology and times were moving on. 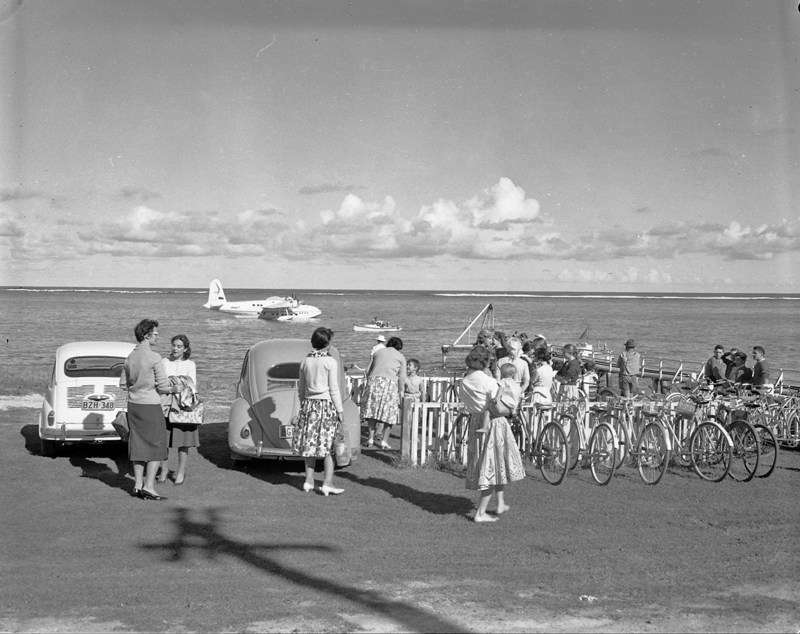 A land airstrip was constructed on Lord Howe and Qantas brought in modern planes to carry larger numbers of people from Sydney and beyond with greater speed. Stevie Wright replaced Perry Como and Bing Crosby in the Australian music charts, and Jenny Kee and Linda Jackson’s fashions were setting the new mode. When Beachcomber and Islander left Lord Howe for the last time in 1974, the brief golden age of Australian aviation shimmered into history. Touch down or take off? A flying boat at Lord Howe Island c. 1951 ANMM Collection: object number 1404 by Gervais Purcell, courtesy of Leigh Purcell. What became of the two surviving Ansett flying boats? Well, both Beachcomber and Islander were sold to an ex-US Air Force pilot, Captain Charles Blair (husband of actress Maureen O’Hara). Islander was renamed Excalibur and Beachcomber became Southern Star. 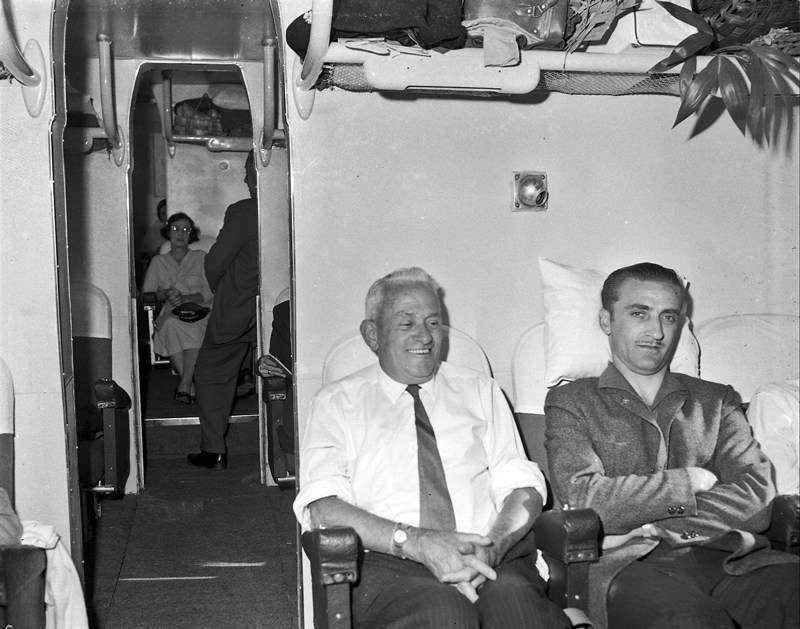 Both planes were intended for a tourist service carrying passengers between New York and the Virgin Islands. 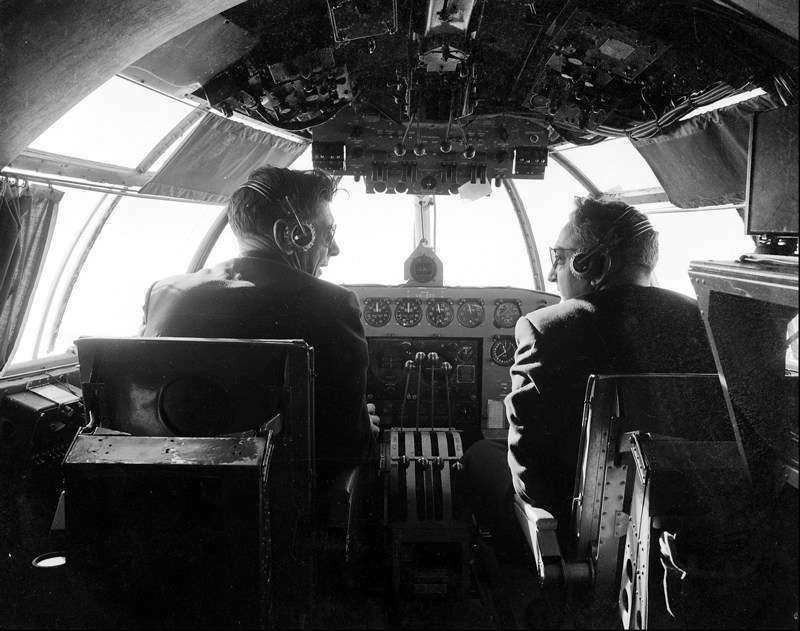 While this vision never came to pass, it is said that Blair and O’Hara flew Southern Star frequently and that a seat was added to the flight deck especially for O’Hara. When Blair died in 1978 the flying boats fell into disrepair and were eventually sold to cover debts. Excalibur was sold privately and is thought to have eventually made its way into an American aviation collection. Southern Star was bought by the Science Museum in the United Kingdom and was prepared as the centrepiece of the Solent Sky Museum at the Southampton Hall of Aviation. When the museum opened in May 1984, Beachcomber reappeared restored to name, body and interior in the Ansett colours. If you’d like to know more about the golden age of Australian aviation beyond the flying boats, you can read this interesting article by the late Warwick Abadee (1935–2015), one of this museum’s founding members and longest-serving volunteers. For more stories on our collections, subscribe to the Australian National Maritime Museum’s blog.